NVIDIA has finally launched high-end graphics cards based on its Maxwell architecture, and their performance and price are bad news for AMD. NVIDIA (NASDAQ:NVDA) has been the leader in the discrete graphics market for some time now, after increasing its market share to about 65% in the first quarter of 2014 the expense of Advanced Micro Devices (NASDAQ:AMD). While new products have shifted the balance of power back and forth over time, NVIDIA has consistently maintained its lead in recent years, and the launch of its newest cards, the GTX 980 and GTX 970, represents a technical achievement that puts AMD's products to shame. Based on NVIDIA's Maxwell architecture, these new cards boost both performance and power efficiency, all while undercutting AMD on price. Of course, a single product launch doesn't mean much in the grand scheme of things, and AMD will certainly reduce prices and eventually come out with new products of its own. However, NVIDIA seems to be pulling further and further ahead of its rival, much like Intel did in the CPU market, and that could have broad implications for both companies. In conclusion, the GeForce GTX 980 represents another stellar performance from NVIDIA. Their reign at the top is not going to go unchallenged -- AMD can't match NVIDIA on performance, but they can sure drive down prices -- but as was the case in 2012 the crown continues to securely reside in NVIDIA's hands, and once again they have done the technical hard work to earn it. While the GTX 980 and 970 aren't the first Maxwell cards to be released, they are the first high-end variants. Earlier this year, NVIDIA launched the GTX 750 and 750 Ti, a couple of low-end cards based on the new architecture, as well as some notebook GPUs, and both cards improved power efficiency significantly. This feat is even more impressive given that NVIDIA is still using the same 28-nanometer process that it has employed since 2012. Neither NVIDIA nor AMD have been able to move to a 20nm process, with TSMC's capacity going to system-on-a-chip designers like Apple and Qualcomm. It's unclear exactly when NVIDIA or AMD will make the move, but the days of relying on process shrinks every couple years in order to boost performance might be coming to an end. Source: Tom's Hardware, Wikipedia, and Amazon. The GTX 970 undercuts AMD's flagship Radeon 290X card by $150 while essentially matching performance and being significantly more power efficient. The GTX 980 outperforms the 290X and is even more efficient for just $50 more. It's clear AMD is going to need some serious price cuts in order to compete with NVIDIA's new cards. 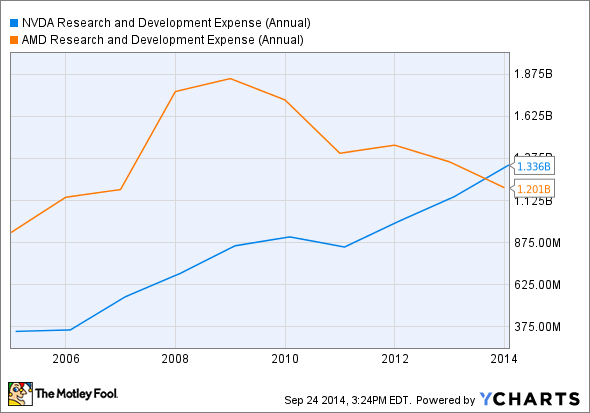 NVDA Research and Development Expense (Annual) data by YCharts. NVIDIA now outspends AMD on research and development, and given that AMD spreads this money among PC CPUs, server CPUs, and GPUs, it's safe to say NVIDIA is handily outspending AMD in graphics research. I made this point earlier this year, and the release of these new cards seems to be evidence that NVIDIA's technological lead over AMD is growing. A bet that AMD can surpass NVIDIA to lead this market seems like a long shot at this point. The GTX 980 and 970 cement NVIDIA's lead, and will undoubtedly force AMD to dramatically slash prices. NVIDIA has managed impressive gains in power efficiency with its latest Maxwell-based cards, and with AMD only able to respond with price cuts for the time being, NVIDIA's lead in the GPU market looks safe. We'll have to wait and see if AMD's upcoming product releases can close the gap, but given NVIDIA's R&D advantage, AMD appears to be at a permanent disadvantage.